Cooking is a lot like writing in many ways; the further along I get as both a writer and a cook, the more I notice the similarities. For example, in both writing and cooking, clarity is key. You can fill a sentence with lots of high-falutin words, just like you can fill a dish with lots of high-falutin ingredients, but if the idea doesn’t come across, then you’ve wasted your time. Another similarity? Breaking the rules. It’s fine to break the rules in both writing and cooking–see: Pale Fire, the Cronut–but you’ve got to know the rules before you break the rules. 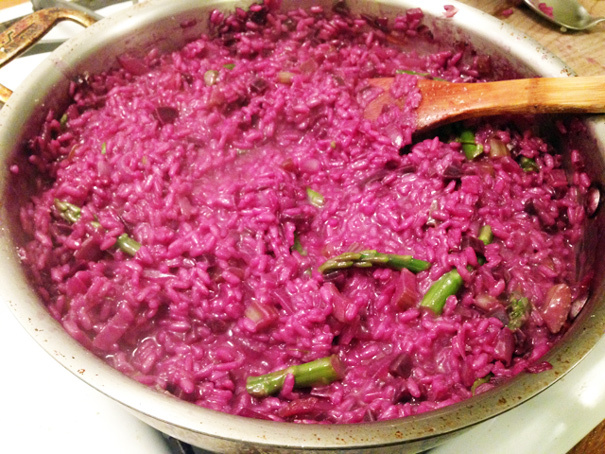 And so it was that on Sunday, I had some purple carrots from my CSA, along with asparagus and red wine, and I decided to go bonkers making something I know how to make very well: risotto. Looking back on my 11 year (!!!) food writing career, I’ve been very spoiled in one major way: being taught firsthand by majorly talented chefs. Most of that’s in my cookbook; but there was also that web series I did for Food2.com a few years ago. 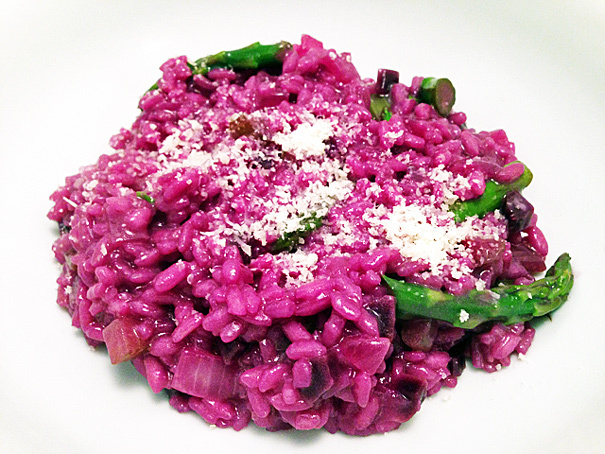 For that, I was lucky enough to learn how to make risotto from Cesare Casella, one of our country’s great Italian chefs. The rules are pretty simple: start with some fat in a skillet (I used 2 tablespoons of butter, you can also use olive oil) and meanwhile bring a big pot of chicken stock to a boil and season that well. (This is my favorite way to use homemade chicken stock which, it just so happens, I made recently.) 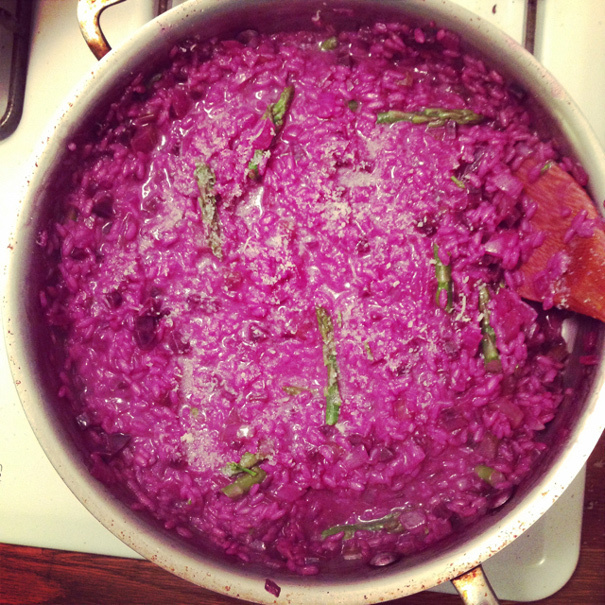 Add chopped onion to the butter with a pinch of salt, cook until translucent, then add a cup or so of Arborio rice. Stir the rice in the fat and onion until toasty, then add a glass of white wine. Stir and cook until that evaporates then begin ladling in your chicken stock; covering the rice and controlling the heat. You want the stock to cover the rice and to be perking away nicely, not roaring fiercely. Your goal is to draw the starch out of the rice over the course of 20 minutes or so, and you do that by continuing to ladle in chicken stock as it gets absorbed. If you run out of stock, just add water to the stock pot. The most helpful word that Cesare used in teaching me was “wave.” He said the risotto should move in the pan like a wave and that makes a lot of sense when you’re about 15 minutes into the process. Also, as you chug along, you can start adding your other ingredients to the risotto: asparagus, mushrooms, whatever you want. Just leave enough time for whatever you’re adding to cook in the hot rice and broth. The other key step is called “Mantecare”: when your risotto is fully cooked and tastes great, you take it off the heat and stir in another tablespoon of butter and lots of grated Parmesan cheese. So now you know the rules and I can tell you how I broke them. At the beginning, instead of just onion, I added a soffrito made with purple carrots, celery, and onion. The purple carrots dyed everything purple; so when it came time to add wine, I added a glass of red (it just so happened that I only had red wine at home so that worked perfectly). About halfway through the cooking, I started adding pieces of asparagus because asparagus came in my CSA (in November! How weird) and I wanted to use it up. Then, at the end, I stirred in butter and cheese and my finished risotto was a Seussian marvel. So if you get your hands on some purple carrots, now you know what to make with them. And if any real Italian is hovering nearby, don’t tell them that you learned this from me.